Both the Senate and House health bills are examples of the kinds of work disincentives (see also here) created by our own government that made employment fall so much more during this recession than it had to, and guarantees that the ratio of employment to population will for decades remain below what it was before President Obama took office. The basic problem is that people keep less of their income at the margin because not only does earning income cause them pay more state, local, and federal tax, but it also causes them to lose government health benefits. 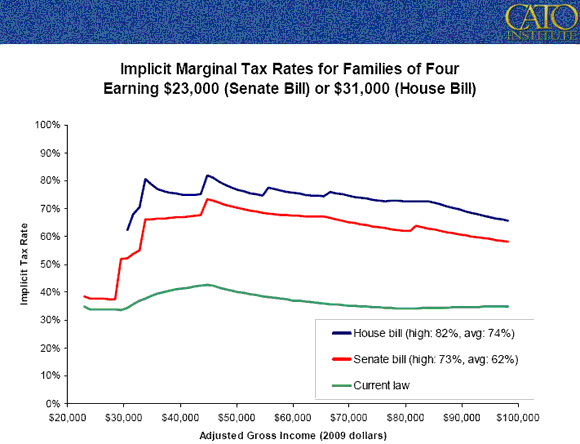 The chart below displays estimates of marginal tax rates for various income groups, under three laws (the chart was made in January, so “current law” meant neither House nor Senate bill). This chart comes from a Cato Institute study, and was displayed on the Kaiser Foundation’s web site. I do not yet understand why the marginal tax rate hikes from the plans are significantly greater in this chart than shown in the WSJ, which cited the study above. The WSJ chart is below (has Senate plan only), and at first glance seems more credible to me (but I am checking into the differences and will post better-than-first-glance conclusions later). 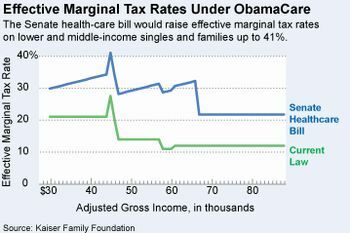 But both charts agree that marginal tax rates will be significantly higher. An important part of my interpretation and forecasting of the macroeconomy was the assumption that higher marginal tax rates were here for the long term — I have to thank lawmakers for making my forecasts come true! 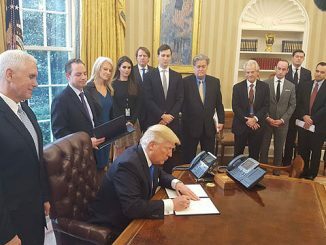 The Most Aggressive Tax Authorities in the World?